Penmaen is in the Gower Peninsula, near Swansea. This painting is of a ‘peeking out’ view from a car slipping out of a parking area which serves as a place to park and then walk down a rubbly, foot twisting lane, which sports a green grassed mohican, to either the bays, Cliffs or Tor. The view of the road, double yellowed lined, shows a distant bend. The yellow lines warn off and discourage day trippers and tourists from the temptation of parking here, illegally and dangerously. A temptation which is ripe when the wee car park is full, and that doesn’t take much doing. The lines run perpendicularly to the heavy, wooden gate which swings outwards creakingly and inwards invitingly to the ankle damaging, unkempt lane that worms it’s way to the gorse cwtched paths which stumble their way down to the bays. Three Cliffs straight and Tor on the left turn. Each heart sighingly beautiful. Given their beauty, the wee car park at the head of the walk, around the corner from Penmaen bend, is normally crammed with cars. Hence this area is a busy, at times hectic, part of Gower, in a normally tranquil stretch of road. I have tried to catch this incongruity in my painting. I represent this ‘frisson’ or tension even in the use of a ‘london bus red’ post box and the alarmingly bright yellow lines which are normally associated with more inhabited locales. 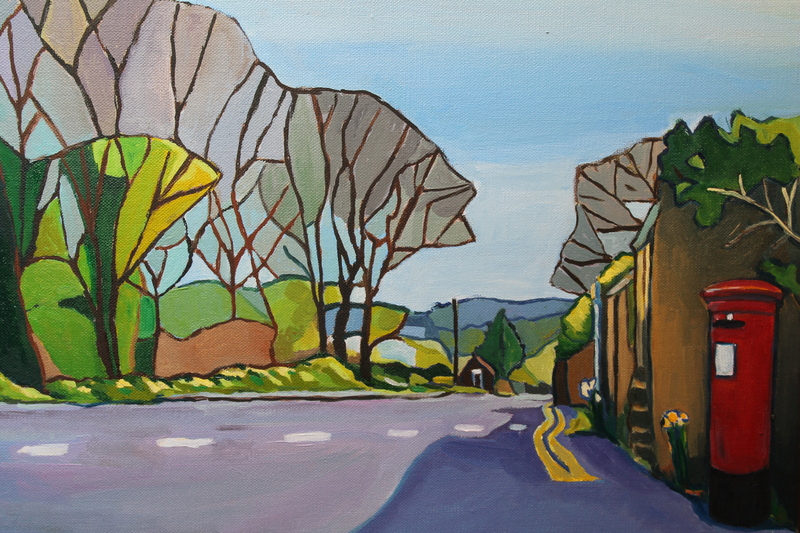 The double yellows seem to offset the playful trees, bushes and far away hills which balance the painting. The yellow lines also ‘drive’ attention into the distance and the ‘bend’ itself. To those who don’t know or are not familiar with this bit of the world, this tranquil idyll can surprisingly cause some anxiety as the ‘pull-out’ onto the country road requires a heightened vigilance and precise timing as not only does the long distance view, you see in the painting, partially obscure the oncoming traffic, constant during the heady summer days in this awarded area of outstanding beauty, but the obscuring bend to one’s left is acute and allows a limited distance in which to get out onto the safety of the road, with the boot tucked in and away from oncoming traffic, often seen too late as it careers around this left bend. ‘Pulling out’ requires the quelling of the beating heart and a ‘bit of gas’ to make sure. This sudden need for heighten attention always seems odd and jarringly juxtaposed to the meandering absentmindedness of the leisurely dog walking, full lunged, brow sweated rambling, gorse smelling appreciation and generally sunbaked revelry that has preceded it. I hope there is a hint of quiet, lurking menace in the painting as a result. One of my husband’s favourites this, also. He likes the light in it, particularly. He suggests that the light, to him, is ‘heightened’ and similar to the sophisticated, precise ‘Pixar’ like animated light. Which is an interesting observation. I seek to paint the ‘experience’ of light on colour and form. To achieve this requires the heightening of the effect of light otherwise light can often be dampened or subdued by the absorbing colours. I am much more interested in how light invigorates, resonates, generates or dare I say it animates colour and form, rather than simply dressing it, licking or caressing it. The light is thus generated in this painting, almost coming from within not from without. Without having had the life sucked out of it by colour. This may be what my husband means by ‘animated’ light. This effect is underscored by my use of drawing lines around colours and form, as with the fauvists, and others have suggested this too gives off an animated feel or quality. I also appreciate this observation as I want colour to be the product of being generated, animated by light as if light was the genesis of colour. Thus light creates the colour in a sense rather than colour simply being illuminated by it.